Amigos! La Fiesta De Salchica is just days away! 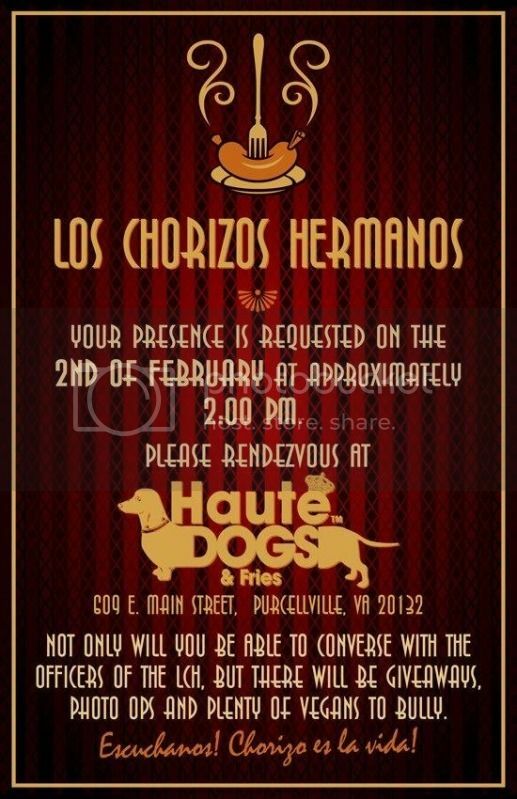 Join the LCH at 2:00 Pm THIS Saturday (2/2/13) at Haute Dogs & Fries in Purceville, VA for a celebration of gluttony, as we profess our love for all things sausage while simultaneously spewing hatred for all things vegetable. Remember…We took the Hot Dog, now we take the chorizo. You tell the Vegans we’re gonna paint Virginia with their mustard. Two coats! We’ll festoon our bedchambers with their relish. How does one describe how their family came to be? How does a man tell the story of his people? How does one sing you the song of his forefathers, the way his forefathers intended? Maybe the words of another, wiser man are the best way to convey the magnitude that is the inception of Los Chorizos Hermanos. Our story starts where most delicious stories do: South of the Border. And so, Los Chorizos Hermanos came to be. A force the world had never seen and would never seen again. A tightly knit group of brothers obsessed with one purpose. One common goal. A singular reason for being. The consumption of spicy sausage and the shaming of those that don’t. LCH will take you in. LCH will be your family, but don’t eat a salad in front of them. Don’t unwrap a cucumber sandwich in front of them. Don’t confuse kindness with weakness. To join the struggle, click here.